You may recognize 1111 Chouteau as that blank-walled, orange brick box that you pass as you head northbound on the Tucker viaduct into Downtown St. Louis. Or you may not — given how plain the building is, it almost appears to be a giant box constructed to conceal utilities or some other unsightly land use. 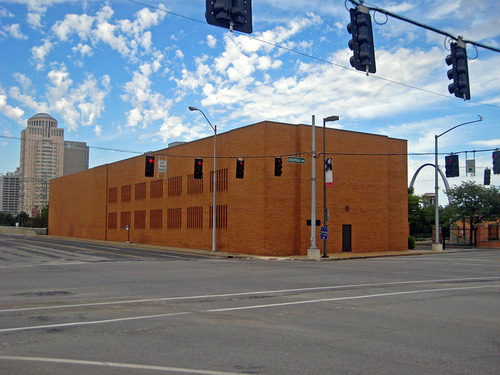 Ralston Purina has been issued a $600,000 interior and exterior alterations permit for 1111 Chouteau. Will they keep the facade (a 1960s re-do of a 1924 bank building) as it is? 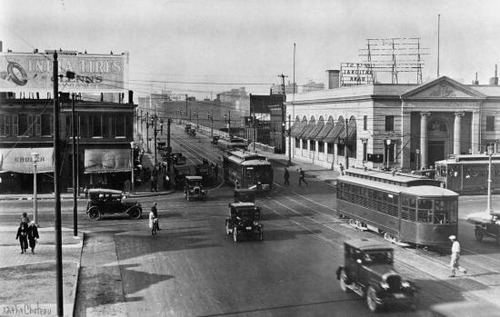 Thanks to Paul Hohmann for digging this image up — and showing the building’s potential to once again (attractively) welcome travelers into Downtown St. Louis!